Arther needs to make room on his hard disk drive. He asked the Desktops forum for advice. Cleaning your hard drive can be an unpleasant chore, involving difficult decisions about what files you can do without. But sometimes, it has to be done. The first thing you should do is run Windows' own Disk Cleanup utility. Select Start, then All Programs, Accessories, System Tools, and Disk Cleanup. It probably won't free up much space, but it takes care of the low-hanging fruit. Serious cleaning will require more work. I'm going to concentrate on two chores that I've found particularly productive: removing duplicates, and finding the fattest folders. A shocking amount of space may be taken up by duplicate files--especially duplicate media files. A program that can search them out and show them to you can be a big help, especially if it provides enough information to let you make intelligent decisions. I recommend DigitalVolcano's Duplicate Cleaner. It's easy, powerful, versatile, and free. 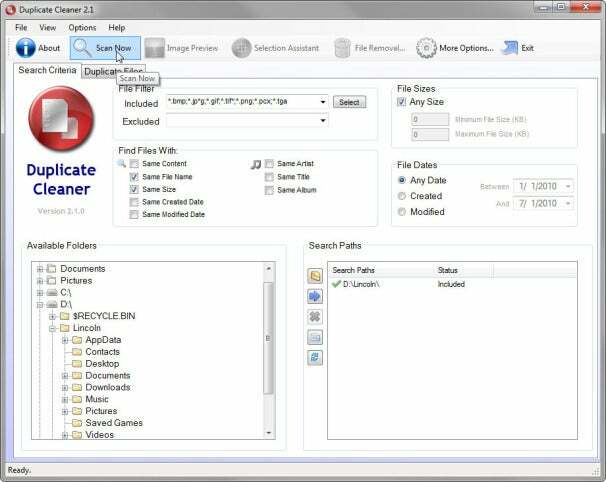 You can set a lot of options controlling how this program will scan your hard drive. You can tell it what kind of files to look for, and define exactly what you mean by duplicate files (any combination of matching size, content, file name, and/or date). If you're hunting specifically for music, it can search by artist, title, and album. You can also tell it to ignore files below a certain size, which lets you concentrate on the big files whose removal will make a difference. 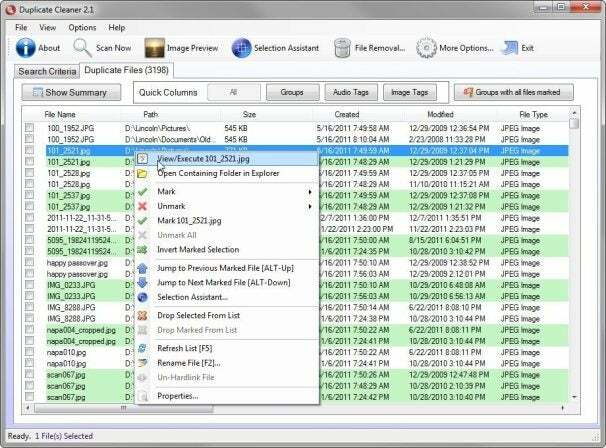 After it's finished scanning, Duplicate Cleaner displays files in matching colors, allowing you to easily see which ones are duplicates of each other. You can open a file, open its location on the hard drive, and select files by criteria. Once you've selected the files you don't want, you have options to delete, move, or rename them. But not all problem files are duplicates. You may have to go through your folders, looking for other files you can do without (or move to other storage media). You can save time on this chore by concentrating on the most bloated folders. For this job, I recommend TreeSize Free. Once it scans a drive, it displays a simple tree-list of folders and files, with the largest on top. With that, you can easily zero in on the folders that are most likely to contain waste.